It’s fitting that Donald (Don) Bock was presented with the “Big Brother of the Year” award at a meeting of the Santa Maria Sunriser’s Lion’s Club. This is where he was introduced to Family Service Agency’s (FSA’s) Big Brothers Big Sisters program three years ago at a recruitment presentation. “It was a moving presentation. I realized that there are so many kids that need a Big Brother,” said Don a retired corporate safety officer who raised two children. Don is Lion’s Club President-elect and has been with the organization for over 10 years. He is also the District 4 Global Leadership Team Coordinator. What Don didn’t realize is the impact he would have so quickly on his Little Brother. Don was matched with 10-year-old Iciano, who didn’t have a male figure in his life at the time. A former Little League coach, Don used baseball as a way to connect with Iciano, or “Ciano” for short. Using positive reinforcement techniques, Don helped Ciano improve his skills. Within weeks, Ciano hit his first home run. His new-found confidence helped him to be a better teammate as well as a better student. He became more focused on his future and starting to think about college or a career in the military, according to Don. 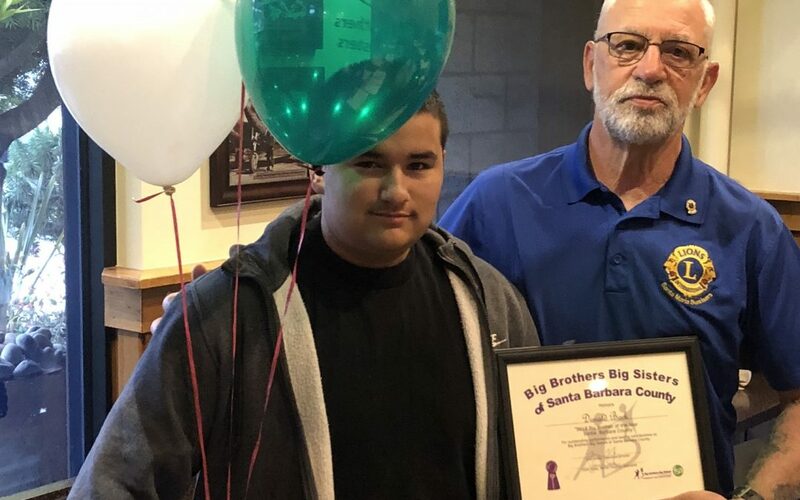 Don is part of an exciting extension to the Big Brothers Big Sisters of Santa Barbara County program, the Boomer Bigs Club which pairs individuals 55 and older with a young person. Mentoring through the Boomer Bigs Club allows for volunteers like Don to remain connected to young people and for young people to gain from the wisdom and experience of an older adult. BBBS is a volunteer and donor-supported program that helps hundreds of Santa Barbara County’s vulnerable youth each year navigate through the challenges life with the guide of an adult mentor. Studies have found that children enrolled in Big Brothers Big Sisters are more likely than their peers to perform better in school, behave non-violently, avoid illegal drugs and alcohol, and have stronger family relationships. Last year in Santa Barbara County, 96% of participating youth avoided delinquency, 73% improved academic performance, and 76% improved relationships with family and peers. Family Service Agency of Santa Barbara County raises all funds through private sources to support volunteers and youth enrolled in the Big Brothers Big Sisters program. Each match costs approximately $1,500. If you are interested in donating or volunteering, please visit our website.